For a given code and turbulence model, create a directory with all filled-out data submittal forms (with their original names) in it. If you are not using an optional file, please remove it. The directory should be named: ID_Lastname_Code_Model_Otheridentifierifneeded (e.g., 011_Jones_CFD++_SST-V), where "Code" is the CFD code's name and "Model" is the turbulence model type. The ID number will be assigned to you by the committee. Tar and gzip the directory. Results from a different code and/or different turbulence model need to be put into a different directory. Use separate directories for any circumstance where it makes sense to do so. For example, if running all the cases on more than one grid series, use a different directory for each set of results. Note: velocities are nondimensionalized by Uref or Uinf, which represent the TOTAL reference or freestream velocity (not u-component). Note: minor typo correction was made to all of the case2x_vel_v1.dat forms on 04/11/2017: "inches" should be "mm" in the comment section. Because, this was very minor typo only, the "v1" designation was retained and the existing files were merely replaced. 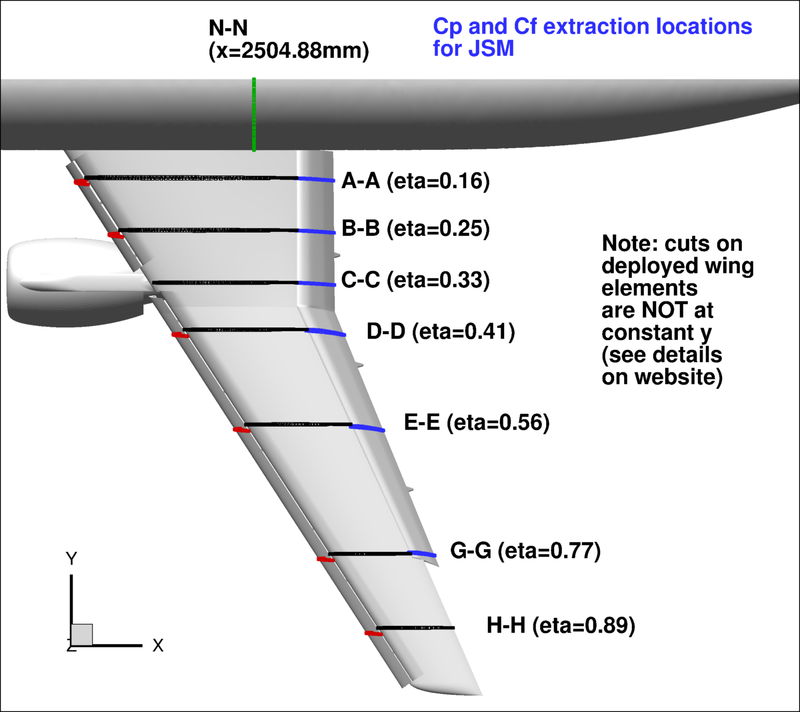 When extracting velocities for the HL-CRM or the JSM, extraction below the wing is not necessary (but it is is OK if you do); also, extraction far outside of the wing's boundary & wake layers is not necessary (but again it is OK if you do). All CFD data should be given in deployed (un-stowed) coordinates (i.e., directly from the grids as computed). If participants analyzed additional conditions not asked for, they are encouraged to include them in the data submittal if desired. 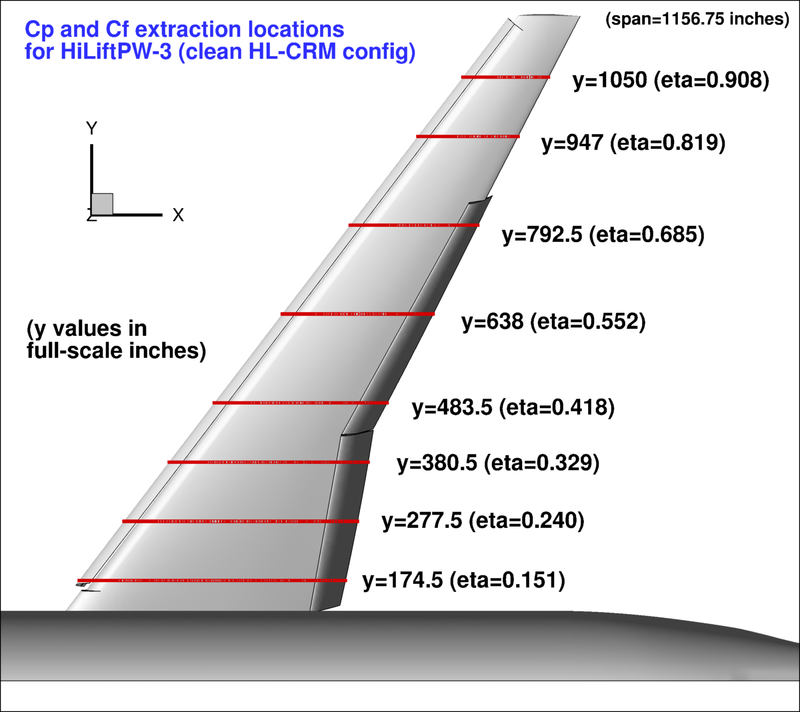 Note that the HL-CRM configuration is defined in the +Y plane, in inches. For those participants with access to Tecplot, a macro file is provided here that can be used to extract data on the surface at all of the requested pressure tap locations: HiLiftPW-3.HLCRM-SectionalCutter_v2.mcr Some editing will be required... see instructions inside the file. 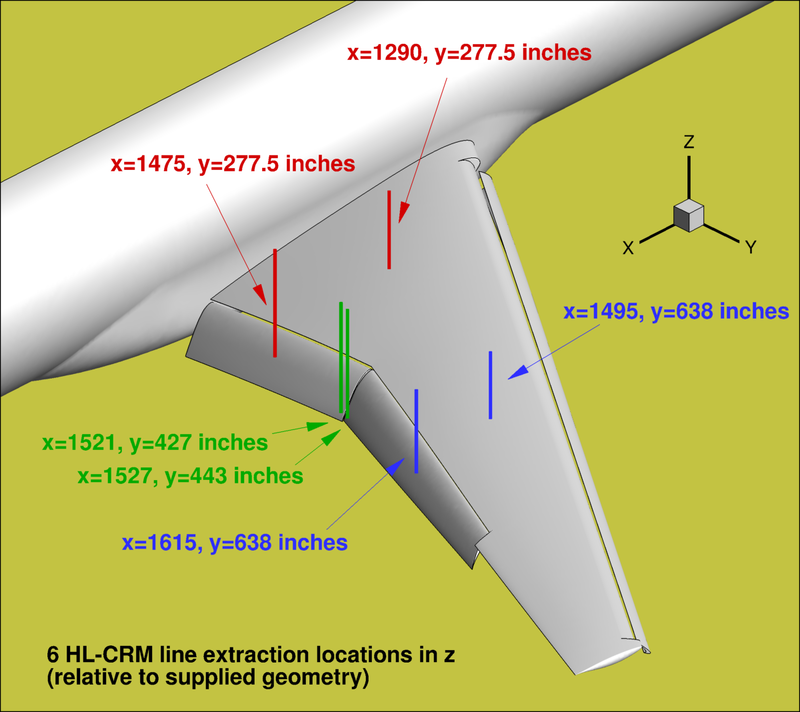 Velocity profile extraction for HL-CRM is along 6 different lines in the z-direction, as shown below. Note that x is aligned with the fuselage (x is NOT aligned with the freestream velocity vector except at alpha=0). Note that the JSM configuration is defined in the -Y plane, in mm. The following text file defines planar cuts that intersect the pressure taps for the 7 span stations on the main wing, slat, and flap when in deployed position: CuttingPlane_JSM_v2.txt. For those participants with access to Tecplot, a macro file is provided here that can be used to extract data on the surface at all of the requested pressure tap locations: HiLiftPW-3.JSM.SectionalCutter_v2.mcr (updated 03/29/2017) Some editing will be required... see instructions inside the file. 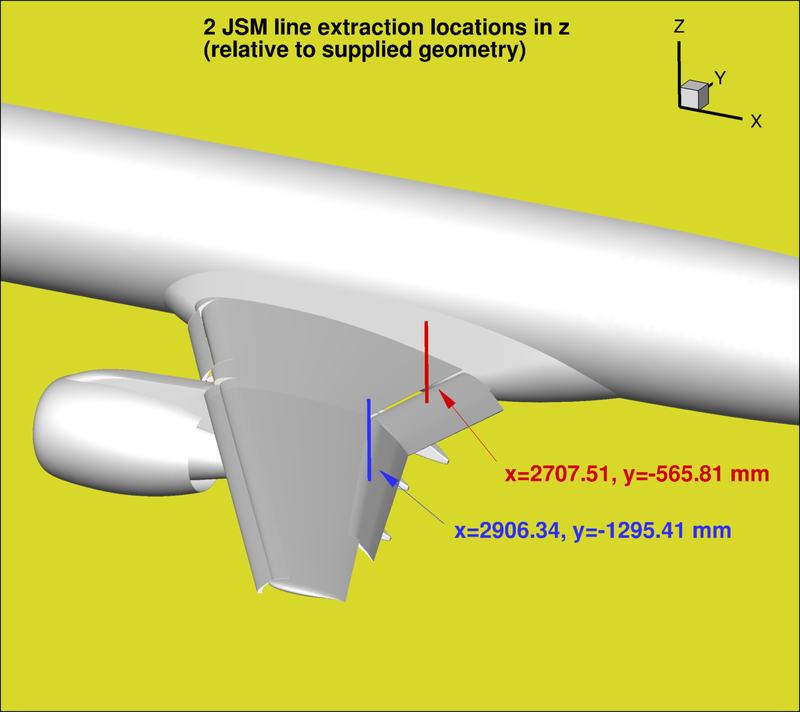 Note that while the above file CuttingPlane_JSM_v2.txt provides equations for the planes that cut the wing elements, the macro instead provides a point in each plane plus plane normal vector. Velocity profile extraction for JSM is along 2 different lines on the flap in the z-direction, as shown below. Note that x is aligned with the fuselage (x is NOT aligned with the freestream velocity vector except at alpha=0). In addition to the requested data, participants are encouraged to report other comparisons or things learned during their investigation. For example, issues related to side-of-body separation, trailing-edge separation, edge or tip vortices, unsteady flow, transition, comparisons on the fuselage or on the nacelle/pylon, analysis of component forces on individual elements, etc. are all welcome.